TTTS is a specific condition that only occurs in monochorionic twin pregnancies. 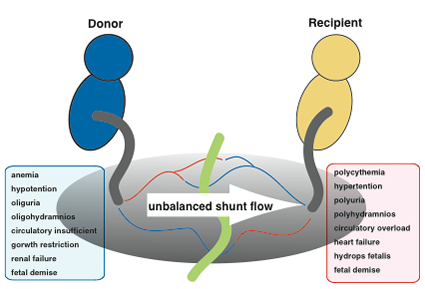 When twins share a single placenta (monochorionic twins), the blood vessels connected mutually in the shared placenta (anastomotic blood vessels) allow blood to flow between the two fetuses. Normally a balance is reached in the blood flow between each twin and pregnancy progresses without problems; however, TTTS occurs if this balance is disrupted and blood flows disproportionately to one twin or the other. When the condition progresses and become severe, generalized swelling can occur in the fetus receiving excess blood (recipient), resulting in heart failure and hydrops fetalis. In addition, fetal urinary output increases, causing polyhydramnios. On the other hand, the fetus outputting more blood (donor) remains small and underdeveloped, and the resulting decrease in urinary output can lead to renal failure and oligohydramnios. This condition occurs in approximately 5-10% of monochorionic twins, and infant mortality is virtually 100% if left untreated. TTTS is not a disease that occurs in just one twin; it is characterized by the conditions becoming worse for both fetuses. Symptoms occurring in the mother are known to include a sudden expansion in abdominal girth and the uterine fundus caused by polyhydramnios. This leads to a sense of upper abdominal pressure and uterine contraction, etc. Along with the expansion in maternal abdominal girth, the mother often reports dry mouth (feeling of thirst). Furthermore, prior to the onset of TTTS, there is sometimes a sudden increase in the weight of the mother (weight gain of 1.5Kg or more within a week). Diagnosis is performed via an ultrasound examination. In monochorionic diamniotic twins, TTTS is diagnosed from the simultaneous occurrence of polyhydramnios and oligohydramnios. This assumes that diseases causing oligohydramnios or polyhydramnios have been excluded. • Polyhydramnios (ultrasonography shows a maximum amniotic fluid depth greater than 8cm) and oligohydramnios (a maximum amniotic fluid depth less than 2cm) occurring simultaneously. • Other conditions effecting polyhydramnios/oligohydramnios must be excluded. Polyhydramnios: Fetal intestinal atresia, or stenosis, difficulty swallowing, neural tube defect, etc. Oligohydramnios: Rupture of the membranes, urinary tract atresia, renal agenesis, etc. Note 2: Blood flow abnormalities in the form of any of: 1) absent or reverse end-diastolic velocity in the umbilical artery; 2) reverse flow in ductus venosus; or 3) continuous pulsation of the umbilical vein, noted in either the donor fetus or the recipient fetus, are sufficient for a Stage III diagnosis. Note 3: If a blood flow abnormality is noted but the donor fetus’ bladder is visible, the case is sub-classified as Stage III atypical, while if the bladder is visible, it is categorized as Stage III classical. Note 4: If a fetal edema is noted in either the donor fetus or the recipient fetus, the case is diagnosed as Stage IV, regardless of either blood flow abnormalities or confirmation of the donor fetus’ bladder. Note 5: Cases in which either the donor fetus or the recipient fetus has died in utero are diagnosed as Stage V, regardless of blood flow abnormalities, the presence or otherwise of hydrops fetalis, or confirmation of the bladder. Treatment for TTTS should be considered based on the gestational age and severity of the TTTS. If the fetuses have reached a gestational age that makes it possible to survive outside the womb, for example 26 weeks gestation or more, the most basic treatment is to induced delivery and perform standard neonatal care. When extra uterine survival is difficult, fetoscopic laser photocoagulation (FLP) for the communicating vessels is selected for the first line treatment for TTTS. Amnioreduction (AR), to remove amniotic fluid from the polyhydramniotic recipient twin, should be selected for cases in which maternal conditions are poor and unqualified for FLP. 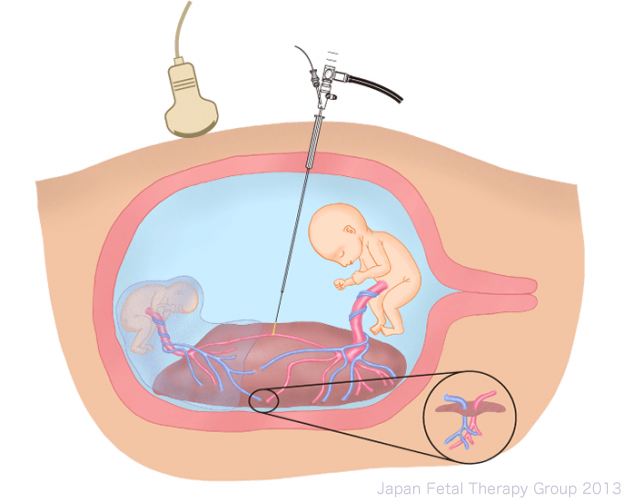 The curative treatment of TTTS is to make the circulatory systems of the twins completely independent of each other by photocoagulating the placental anastomoses, which are the cause of TTTS. FLP is considered the first line treatment for TTTS before 26 weeks of gestation. Even when TTTS is diagnosed, the procedure is not performed for all patients. The following criteria must be met for a patient to be eligible for this procedure. FLP has been covered by insurance since 2012 in Japan. After adequate anesthesia for mother and fetuses, using epidural or local anesthesia, a small skin incision is made in the abdominal wall of the mother, and a broad (3.8mm) needle (trocar) is inserted into the amniotic sac of the recipient fetus. A fetoscope (2mm-3.5mm) is introduced via the trocar and all anastomotic vessels on the surface of the placenta are located. The anastomoses are then coagulated using a medical laser (400-1000µm) inserted through the fetoscope. After all anastomotic vessels have been coagulated, amniotic fluid is removed and the procedure is completed. Most procedures can be treated with a single trocar; however, in very rare instances an additional trocar may be required. Amniotic fluid removal (AR: amnioreduction) is carried out for cases when FLP is not possible for various reasons. Local anesthesia is applied to the mother and an amniocentesis needle (<1mm) is inserted into the uterus, in order to remove excess amniotic fluid. The objective of this procedure is to lessen the symptoms caused by polyhydramnios (uterine contractions and pressure on the mother’s body), and to extend the duration of the pregnancy. In some cases, removal of the amniotic fluid improves the symptoms of TTTS; however, in many cases, repeated removal of the amniotic fluid is required. If the treatment is successful, pregnancy can be continued and fetal prognosis should improve. Specifically, from the maternal perspective, there is over 90% chance that at least one fetus will survive, and a 67% probability of both fetuses will survive. From the perspective of the baby, the survival rate is 80%, with neurological complications in a maximum of 5% of survivors. Untreated, the probability of fetal demise is virtually 100%. Moreover, with amnioreduction therapy only, although prognosis will vary, results are poorer in all stage of TTTS than with laser surgery. Treatment is not possible in all hospitals. At present, there are eight institutions in Japan offering treatment (as of January 2014). 1.M. V. Senat, J. Deprest, M. Boulvain, A. Paupe, N. Winer and Y. Ville. Endoscopic laser surgery versus serial amnioreduction for severe twin-to-twin transfusion syndrome. N Engl J Med 2004; 351: 136-144. 2.T. Murakoshi, K. Ishii, M. Nakata, H. Sago, S. Hayashi, Y. Takahashi, J. Murotsuki, M. Matsushita, T. Shinno, H. Naruse and Y. Torii. Validation of Quintero stage III sub-classification for twin-twin transfusion syndrome based on visibility of donor bladder: characteristic differences in pathophysiology and prognosis. Ultrasound Obstet Gynecol 2008; 32: 813-818. 3.M. Nakata, T. Murakoshi, H. Sago, K. Ishii, Y. Takahashi, S. Hayashi, S. Murata, I. Miwa, M. Sumie and N. Sugino. Modified sequential laser photocoagulation of placental communicating vessels for twin-twin transfusion syndrome to prevent fetal demise of the donor twin. J Obstet Gynaecol Res 2009; 35: 640-647. 4.H. Sago, S. Hayashi, M. Saito, H. Hasegawa, H. Kawamoto, N. Kato, Y. Nanba, Y. Ito, Y. Takahashi, J. Murotsuki, M. Nakata, K. Ishii and T. Murakoshi. The outcome and prognostic factors of twin-twin transfusion syndrome following fetoscopic laser surgery. Prenat Diagn 2010; 30: 1185-1191. 5.K. Ishii, M. Saito, M. Nakata, Y. Takahashi, S. Hayashi, T. Murakoshi, J. Murotsuki, H. Kawamoto and H. Sago. Ultrasound prognostic factors after laser surgery for twin-twin transfusion syndrome to predict survival at 6 months. Prenat Diagn 2011; 31: 1097-1100.